Home/News/What do eggs have to do with Easter? Easter Sunday takes place on the 21st of April this year. Depending on the hemisphere, Easter either occurs towards the beginning of spring in the Northern hemisphere, or the beginning of autumn for those who reside in the Southern hemisphere. Easter, as most know it, is a Christian holiday which celebrates the ‘belief’ that Jesus Christ was resurrected on that day. If the New Testament of the Bible is followed, Easter Sunday has become a day of celebration as it is seen as the day that Jesus Christ ‘rose from the dead’ three days after he was crucified. Easter like Valentine’s Day, has also become synonymous with chocolate, and more specifically in Easter’s case – chocolate eggs. How did this come to be though? Alternatively, the origin of Easter eggs can be traced to the Christian practices surrounding Lent, which resulted in the ‘sacrificing’ of meat and animal by-products for the duration of Lent, including eggs. Because the eggs would not be consumed during this 40 day period, most would hard boil their eggs in order to preserve them for consumption at a later stage. They were also distributed to those deemed to be ‘less fortunate’ so that they too could celebrate Easter. However, The original Easter eggs whether from Pagan or Christian origin, are a far cry from the colourful variation that the Easter bunny is known to hide for children, so where and when did the colourful, dyed eggs and a bunny enter the picture? Briefly, dyeing Easter eggs was thought to have first been done by British royalty; it was also done as a special offering to the church on Good Friday. Only at the beginning of the 20th century, did the dyed eggs become more family and child-oriented. The Easter bunny’s origin is relatively mysterious and there are many theories surrounding its existence and the inherent symbolism in the bunny. 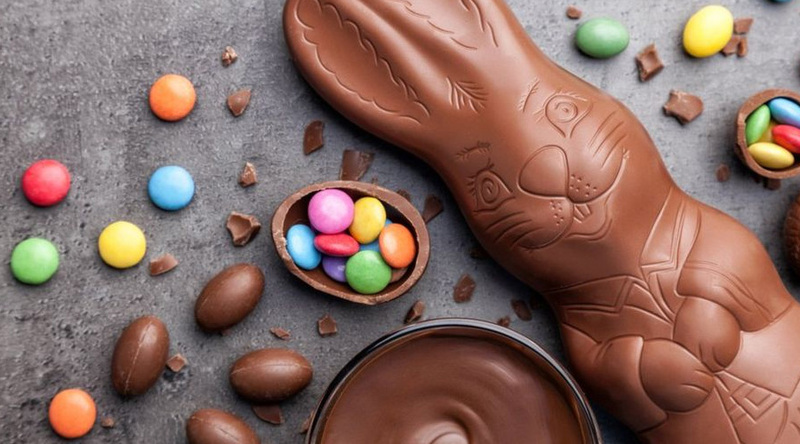 Either way regardless of religious beliefs or origin theories, chocolate eggs and a bunny that delivers them never fails to delight the young and old alike.